Doctor Who fans don’t loose your bags while time and dimension traveling. If you don’t have a luggage tag on your bags then on advice of the Doctor we would suggest this nice Tardis luggage tag. As you can see it looks just like the blue police call box but we all know that it houses so much more. The luggage tag is 2 x 3.5 inch and is made out of durable acrylic. Both sides of the tag have the same picture of the Tardis on it and if you want that is the only thing on it. But most of use would like a bit more from a luggage tag so this Tardis tag is custamizable with the text you want. You can have your current, past or future address printed on it or maybe just your email address, the possiblilities are limitless. This Doctor Who luggage tag has also a letter strap to connect it to your suitcase, backpack, handbag or anything else that could use some Doctor Who magic. So if you are ready to travel with the Doctor then get your own Doctor Who Tardis Luggage Tag. You dont’ want to loose your luggage while traveling and that is why it is smart to have a luggage tag. This luggage tag is based on the story of Alice in Wonderland. As you can see it shows the Cheshire Cat and this is not just a luggage tag nog this tag is hand painted and on the back there is a little window for you information but your have to open it to see it so that people can’t read it quickly and figure out your are on holiday and break in to your home. The luggage tag of the Cheshire Cat is of course also just fun to decorate your bag and things like that. 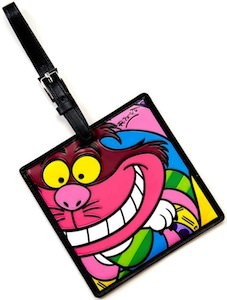 Come have a closer look at this Alice In Wonderland Cheshire Cat Luggage Tag. 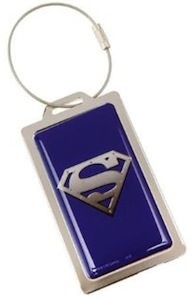 Your luggage can get some super power if you use it with this Superman luggage tag. This metal luggage tag shows the Superman logo on it. And besides being made out of metal this luggage tag also has a metal chain to connect it to your bags. So now you don’t have to worry about loosing you luggage as this tag will stay in place. The Superman luggage tag of couse has room for your information witch is stored on the inside of the Superman luggage tag. We all have our belongings and don’t want to loose them and the easy way to prevent things from getting lost is to mark them. But how do you mark a backpack or a suitcase? Simple get a luggage tag on it. And now you can get a luggage tag with Lightning McQueen on it. The fast red race car number 95 from the Cars movies. 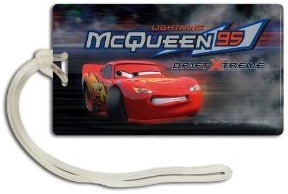 Get ready to travel with your Cars Lightning McQueen Luggage Tag. 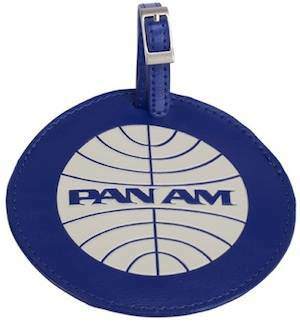 Go back in time and still be from the now with this Pan Am luggage tag. This blue luggage tag shows the Pan Am logo on it and this logo is embossed to make it look even more amazing. As a good luggage tag also the Pan Am one has room to store you information just in case your current airline would loose you luggage as they of course are not as good as Pan Am would have bin if they where still around. There we have Princess Tiana from the movie The Princess And The Frog. You see her printed on a luggage tag together with two frogs. A luggage tag is a smart idea for you kids belongings as small kids seem to loose a lot of things. With a Princess and the frog luggage tag there is a big changes that some one would return it. 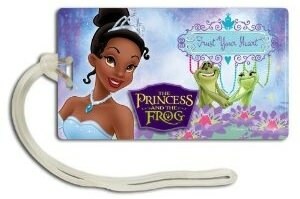 Get ready to travel with the Princess And The Frog Luggage Tag. Traveling through airports often makes it difficult to recognise you bags because all these bags all look the same But stop right there. 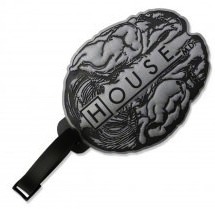 Now you can own a special luggage tag one with a brain from the TV series House on it. It is great for you self or maybe a doctor friend?